I bet that many stories have unravelled behind these battered windows. The light and heat and flies are banished by flimsy shutters with proud layers of new paint, by mesh screens, by pieces of wood sliced up to fit the frames. But people remain within. Much like my little red bird in Bolivia, this scarlet-clad man made my photo. Until recently, property could not be not be sold or bought in Cuba – does he like living here, I wonder? His lifelong home overlooks one of Cuba’s most iconic scenes – the Malecón: the long promenade buffeted by crashing Atlantic waves, as classic American cars rattle along, rusting in the salt spray for half a century. But what does he see when he turns his back on this view? What’s hidden in the blackness behind him? Is it as colourful or as crumbling as the facade? Look closer – there’s a tiny child clinging to the balcony. The peeling pillars block his view of the ocean – will he have to grow old here too? 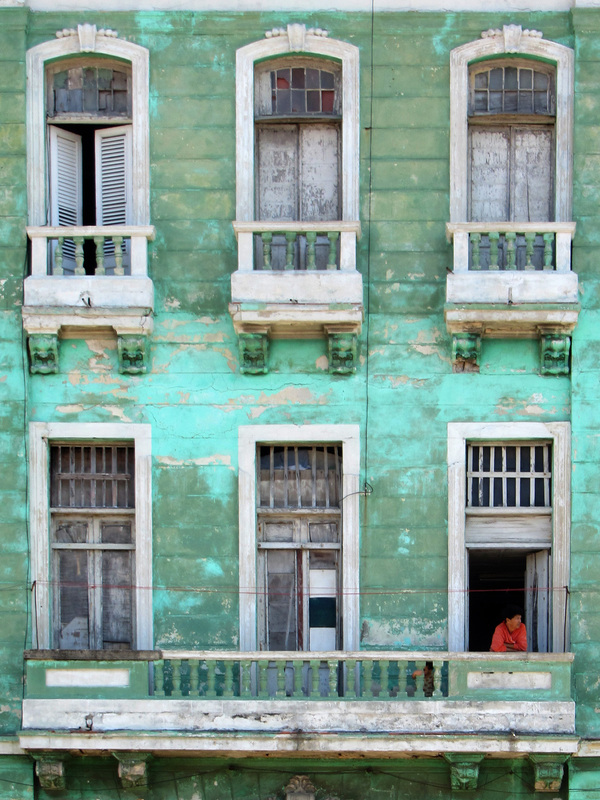 Tags: architecture, colour, cuba, Friday photo, Havana, Malecon, wondows. Bookmark the permalink.